How many keys can you press at once time ? Your keyboard run not so well ? Here the solution! Can my pc support sprites, shadow and parrallax scrolling ? Here is the solution test! I agree, mine was a pessimistic hypothesis, but I am glad you thought otherwise. It encourages me. I sincerely hope you are right. However, it was an attempt to understand why, with all the new ideas proposed by them, many users have not received attentions for their creation, they was not criticized neither in favor nor against. At least as far as I know. I did not know, on this site, those who publish videogames. I'm sorry if I was been inappropriate. And also not very understandable (I rewritted my comments better). Sorry if I answer you only now. Your opinion is certainly more realistic. I think, however, that even if you have a not really winning idea, it can also count the quality of your production, the gameplay and the duration of the game, that is, basically the number of levels installed and the possibility of adding new. Indeed, sometimes, starting from an idea of success, already developed by others in various forms, just because the subject-character of that game is much loved, building a sequel, to which new features are added, can work. I' be on itch.io for almost 2 years and I have published 4 of my video games and 4 of my tools. I only had feedback for the third video game I developed (Connect4); here I open a parenthesis: cause of the lack of a visual contact with the user who published it and the cultural difference, my answer was inappropriate (I was a bit surly, and I'm sorry). Now, I admit that often I have not had an idea, for the design, very original; I also admit that on itch.io itch.io there is graphics certainly better and the music and sound effects are not innovative. However one of them (BounceB) has been classified on itch.io among the best with lateral scrolling and among the best 32 bit programs. I do not have much time to devote this year to development, but if I could get opinions from other users and developers I could improve a lot. For example, my beta-testing is not enough. If there are more people willing to download my video games (or free demos) that give me their opinions, I could invest in free patches with many more levels. Perhaps the price is too high? Or who has tried the demos or the free programs that I published have noticed defects or malfunctions? In fact, nowadays, one can say that physically every PC, also from the same brand, is a machine always different, for the definition of compatible PC (IBM), and it is not easy to guarantee the running on each operating system, or, even on all versions of an operating system such as Windows. This is not about competition or cooperation between developers; more than anything else if user uses itch.io without being an active contributor, or a simple enthusiast of video games, or even just out of curiosity, he could give his opinion, finding itch.io interesting. I do not know if to be interesting it is necessary to be followers, compatriots, acquaintances or friends; I know that Italy does not have a good reputation in the world and I also know that many people's dream is to be American citizens, but, if I'm not too unpleasant, and if you have a little time, could someone answer me? Thanks anyway. itch.io Community » General » General Discussion · Posted in New creative tools to redesign the Pic? In 2009 I developed a program to draw images and create animations that I called AnimEdi and that I would like to convert from 16 to 32 bits. For now only supports low resolution. The formats used are mainly .BMP, .AVI and some native formats such as .OBP, .CHS, and .DAC. is inspired by the old version of AutoDesk Animator which includes the main functions. itch.io Community » General » General Discussion · Replied to null in What happens when your username is the same name? Thanks, it's all true what you said. In fact the address of my page is different from the one provided by the search and in it no longer appears that link. The search can not be different when you specify a username or a game name. It is always a comparison between the specified words and the titles of the applications in the itch.io database. itch.io Community » General » General Discussion · Created a new topic What happens when your username is the same name? If I look for my username to see what I have published, I also see an icon with the title of a science fiction story (the alchemist) in which the protagonist has the same surname. This icon sends me to this address: https://mneu.itch.io/the-alchemist where a videogame is advertised. 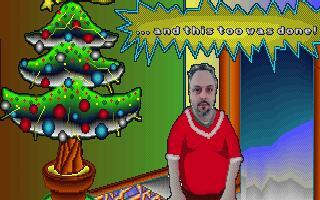 This is wrong, because it seems that the videogame was produced by me, while it is not. Even the address seems strange to me (mneu.itch.io, instead of itch.io). Can someone help me? Anyway thanks. itch.io Community » Game Development » Release Announcements · Created a new topic GrattaV scratch and win game is now completed! Even without money you can have fun scratching the numbers of winnings in a video game that imitates a well-known Italian state contest! Here is the famous "scratch card" called "The Millionaire" in a video game version! The game is completed, now buy it or try the free demo! GrattaV, scratch and win ! I watched it for 5 minutes and above, because my attention was captured by this unusual white-red snow. It intrigued me. Vary according to the wind? Very beautiful! Thank you. I saw that you are interested in knowing what each of us programmers is developing now; so I can tell you that I'm working on a video game a bit critical and contestable, at least here in Italy. In fact, the Italian State has had large profits from the monopolized state sale of the so-called "scratch cards". It is a game that involves many people to the point of becoming a dangerous mania: many spend much money to scratch these tickets and find the winning numbers, becoming poor. So I chose one and I'm developing a harmless video-game, without internet, which makes you realize how much money you can really win with the real one and how much money you lose! What you wrote is really massif! All things you wrote are valid and interesting. As for the "ONE STEP AT A TIME" paragraph, I can tell you that I already follow the instructions you have given and I do not have stability problems (in my program). Instead, as you say in the paragraph "KEEP IT MOVING", I have to be careful not to incur problems of MENTAL STABILITY! I did not know that many developers (you say almost all) are perfectionists and tend to write and rewrite their code to enhance their performance to the detriment of the set of things related to the creation of a video game. I do not lose sight of the set of things to do; I just write some notes (on my PC) and if I can not do it immediately I will do later, but I lose a lot of time in the optimization. Sincere congratulations! itch.io Community » Game Development » Release Announcements · Replied to mrpete in F4_32: The game is now completed! Now I understand. Thank you! Your Italian is very understandable! If you like this video game you can try to download the demo: it's free! Anyway I'm following you too. I tried some of your online video games. They intrigued me. They are fun! I did not know this site, but I'm informed now. I did not understand your comment (my language is usually Italian): I do not know what you saw, but I can guarantee you that my video game is a conversion, but of my previous version, not of software made by others. I'm not a pirate! The conversion was made necessary by the fact that the systems after Windows XP no longer supported it, moreover, I wanted to get a higher graphic resolution and add the music. I'm the only author of the 16 Bit version and of this 32 Bit version. However, it is possible that the 16 Bit version has been duplicated by others, because, a few years ago, I suffered the theft of a portable PC and some USB flash drives. If you have more information, please let me know. I will be grateful to you. itch.io Community » Game Development » Release Announcements · Created a new topic F4_32: The game is now completed! HERE'S AN UNPUBLISHED VERSION OF A FAMOUS TABLE GAME! against the computer and choose the level of difficulty. itch.io Community » Game Development » Release Announcements · Created a new topic ​F4_32: unpublished version of a famous table game! This is a free demo of the video game I'm developing; in the final version you can play against the computer andchoose the level of difficulty. In this 2-player version, using mouse and / or keyboard, and varying the size of the game board at will it will be possible to engineer new victory strategies. Supports two graphic screen resolution (up to 640x400 pixel), music and sound effects. To answer the one who wrote first, I have some things to say, because your questions do not seem many to me! It seems more like a reflection on a critical trend of Itch.IO. Have you ever wondered why, when you put an executable demo, you get several downloads, while if you sell a game for a fee, everyone is reluctant to buy it (except the first copy)? One possibility could be that those who download the demo re-use your data and software on their own or with others. A second possibility is that the ideas and prototypes made by you, are reused by advanced software houses because are more interesting anc can they be re-developeds.. I think it's a very interesting game, even if, for now, I can not play it. It reminds me of a comic strip: "the 'little man line" or something similar that I saw when I was young on TV. OK! Of course: it certainly works. But I had few time to enjoy myself; I may be more lucky! Thank you. I appreciate your comment and I understand that you read all my post. But what is your opinion about what I said? What was your experience? Although the development system is Delphi, I develop almost everything in Assembler, which is fully supported by Delphi, including the latest microprocessor models. I can define everything I want, without having to rely on expensive and heavy software on the market. At school I understood that if you wanted to get a good result you had to do it so. Frankly I'm tired of having to re-learn everything, every time something new comes out, to get what I need, always with some exceptions and without even knowing how it was done. I am from another generation; I saw the birth of the first home computers and the first PCs. it was a nuisance to change computers and operating systems almost every year. Now the operating systems become exaggeratedly heavy, with an interface that is getting worse and less freedom and possibility of using the real potential of a PC; except if you want to spend another capital to buy everything you need. However I can program in C and also in Visual C you can include code in Assembler; but the aforementioned problem remains. The source of my last video game is a text of 41924 lines, divided into dozens of libraries that I wrote and that I can update and reuse in other applications. I do not have much imagination for design and I prefer puzzles or simple pastimes, but that does not mean the potential of my software is limited. I was glad you gave me this advice, because so I explained my ideas about it. Christmas tiring .. Anyway: Merry Christmas to all! No, I was just trying to joke, for not to be dramatic. In fact, what you said, a tomorrow, might be true. Not everyone knows how to sponsor themselves in the best way, and some people may close their business. The answer is a negative exclusive "or" between me and PCDear.ent.games: if I live then PCDear.ent.games lives with me; unless I'm a ghost ... But somebody speak with me; and they listen to me. Then this world is real! I'm glad you like these designs. But is not it also fantastic that I'm not a skull yet? This is an exhaustive response that includes all aspects of this problem. Thank you matthornb for the time you've us devoted ! itch.io Community » General » General Discussion · Replied to Mitron in What is your game developing "routine"
What you said, from what I could understand, it seems to me true. Alone it is very difficult. Having at least one support person is what he would want. It would give us more successful. If I understood you, you believe that many games are published within a short time and are not complete, as for the potentialities of the original idea that are not fully exploited or perhaps because we was in a hurry to conclude. I'm partially agreed on this. It is also true that if you want to have a medium gain it makes no sense to spend a lot of time developing an idea without being sure that the public like this idea. Sometimes it is better to produce more in less time than to employ a lot for a great idea, but only for what we believe it to be. itch.io Community » General » General Discussion · Posted in What is your game developing "routine"
But I also deal with marketing, but with moderate success. While I have to have a good idea to create a video game. Find it in my head is almost always impossible. When I created the first version of a video game, the idea was came from the need to flirt witht a woman. I represented a message with colorful three-dimensional scrolling text over an image in motion, with an Assembler language program. She was a painter and did not have much interest in the computer, so I failed; but I kept the source code. Then a my animalist friend, complained of a colleague who do hunting on Wednesday and told me: "Let you do him a joke, paint him as many hunters who shoot him." I also merged sliding text with the demo for a final goal. In a month I built the first 16 Bit version. Then I had to create a sort of editor to define the levels. I invented the screenshots, which I draw AutoDesk Animator, unite images with my own program to create, in about three days, a game-level. After about 3 weeks the graphics were OK. I have programmed the sounds and the music with a language invented by me. Finally, I made the conversion to 32 Bit. In about 3 months. Et voilà, les jeux sont fait! Nice idea. It looks similar at mine idea. Beautiful graphics, although, in my opinion, it is of the "minimalist" type, which, among other things, works very well today. I would not say that the controls are a bit difficult because I have not played to this game yet. Also in my game you can use the mouse to move the ball, but I used another technique (see: BounceB & new adventures Revenge). One question: Why this game is it free? itch.io Community » Game Development » General Development · Created a new topic Buying a development tool or using a rough compiler? I've seen dozens, if not hundreds, of pretty simple games, at least if compared to those of the great video game software houses; all of these are predominantly developed with appropriate development tools, which exemplify their creation. There are advantages and disadvantages. It is true that sometimes it is better not to think of the time and effort that our new idea requires us, but to think, for example, of the satisfaction of being able to say, "I did that all alone"? Furthermore, by storing the pieces of our work so that we can re-use it in our others future works? If we do it, we do not have to study things done by others, looking for that of we need, by found what seems the same of that we need, to say: "not so bad..." . We can each time modify, improve and reuse what that it came out of our head. And everyone has his own style. itch.io Community » Game Development » General Development · Posted in Can you fit a text game in a 64kb download? I did not understand if you are using the Unity tool, but a game of the kind I saw in your screen-shot, in my opinion, can be developed with less heavier but slightly more demanding systems; such as Visual Basic, Delphi, or Visual C. This will you to reduce memory occupation. If you then compress the texts with the Lempel-Ziv algorithm (Zip archives), and keep them in compressed memory, decompressing them only when you view them, this allow you to further reduce the space required. 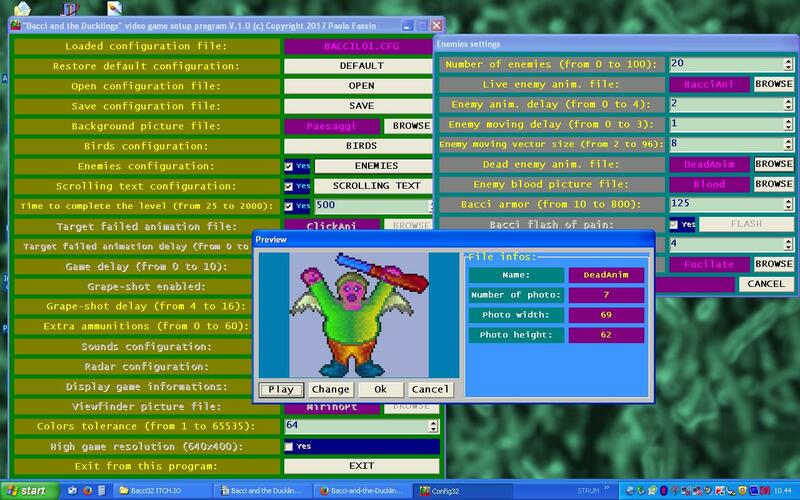 For the images you could encode them as 4-color BMP-Windows (this format still exists), compressing it with the Run-Length algorithm (RLE, supported by BMP-Windows format). I think that doing so it you should succeed! It is not random. Also what you said now was a problem for me. I thought BROWSER meant that the game was inserted into the gaming provider's system (BROWSER), but maybe that term means a game that can be used with the Internet BROWSER (Explorer, Mozzilla, Chrome, etc.). SALE suggests that the game is subject to discounts, but it is definitely the closest option. Is exactly that it's happened to me: but other users have said to me that isn't a real problem. The games' provider need, in some cases, up to 24 hours to publish a game, however send you a notice that the process is starting. itch.io Community » Game Development » Release Announcements · Created a new topic Just created a new LEVEL EDITOR for Bacci & D.
Now is possible to create up to 99 new game levels thanks to the tool BACCI32.EXE! Is also possible to change any existing level, loading new background, new bird/enemy animation and new sounds; BACCI32.EXE can also be used to change “Bacci and the ducklings” video-game settings. If you have just downloaded “Bacci and the ducklings” video-game you can upgrade it installing new patch BC32_P02.Exe; try it, it's free! BC32_P02.Exe: download it, run it and follow the instruction are shown. Very well, thank you for your answer! itch.io Community » General » General Discussion · Replied to Misguided Chicken in Prohibited or allowed to publish ? You've understood well, thank you for your answer. I had doubts about itch.io's rules, which I thought they hold publishing rights on my software, so that it does not allow publications on other sites. itch.io Community » General » General Discussion · Created a new topic Prohibited or allowed to publish ? Hi, hello at all people... I have to ask you a question (sorry): seriously, it is allowed to publish your application also in others site as well as IOTCH.IO, supposing that same application was just published on ITCH.IO ? Or it is prohibited. Tell me what do you think about that, please. itch.io Community » itch.io » Questions, Ideas & Feedback · Posted in no views / followers on itch.io after a month? I've read all your answers, some very interesting. I originally tried to sell my products on eBay before ITCH.IO and I have had very little results, even by supplying printed manuals, light-scribes CDs and home delivery. With "ITCH.IO" I'm found better,but, although I'm here by only 3 months, I have not had a great result yet. The ad technique is, perhaps, valid, but also, in my opinion, one must find the right audience. Hi, hello at all people! I've a question for you: if I create a new version of my application and I prepare installer with Inno Setup Compiler, suppose that I generate a new GUID (Windows register's identificator); what Windows does when the patch is installed ? The same files, supposing i've enabled IGNOREVERSION flag, are replaced, or a backup copy remain in application folder ? And my program accesses to backup copy or new version of files ? For example: 1) the original application don't install PIPPO.DAT file, but the file is generated by the app; 2) the new patch install PIPPO.DAT file... Thank you for read! Give me e response, please.